It’s been twenty-four hours since I salted my kiln and shut it down last night, and the temperature is still about 900 degrees on top. 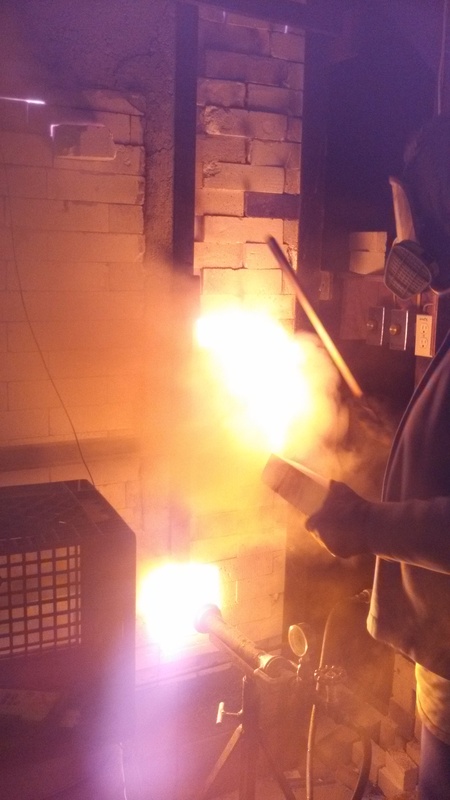 It was a good firing, with a steady climb to 2250 F, the temperature I like to reach for salting. Last evening, I had a friend over who has worked with clay for many years. It was fun to explain my process and a bit about the history of salt firing as I understand it. She also took some pictures while I was at work… here’s the best one. I’ve got my respirator on, and the port brick is in my left hand. I just pushed the burrito of salt into the kiln with the stick in my right hand. Usually there’s not so much flare-out, but my delay in stuffing the port brick back in made for a more dramatic photo. At that point, it was about 9:30 at night, many hours since I began the firing at 6:00 AM. The first hours of the firing are quiet. It’s dark, and the grass is crisp with frost when I go out to the propane tank to turn the gas valve full on. I have placed the burner stands and burners in position, and their needle valves are firmly closed. Righty-tighty.. The main ball valve that supplies the kiln is checked closed as well; my Mom’s pipe wrench at the ready to open it. Dear readers, are any of you fortunate enough to possess your Mothers’ pipe wrench? In the first hours, the burners are quiet and the kiln makes no sound. I have nice Hones nozzles that make for a beautiful flame. I keep a firing log where I record every detail of the firing, logging in the temperatures returned by the top and bottom thermocouples every thirty minutes. I have cone packs in the kiln, but rely on the thernocouples and the state of the kiln to conduct the firing. All the protocols of the firing must be carefully observed each time I fire. It helps me to not be afraid. I have blown up a kiln; a natural gas caternary arch kiln, and the memory comes to fire with me each time I light up another kiln. Intellectually, I understand what happened on that Sunday morning long ago, and know that I will never blow up a gas kiln again. Still, I think of it. 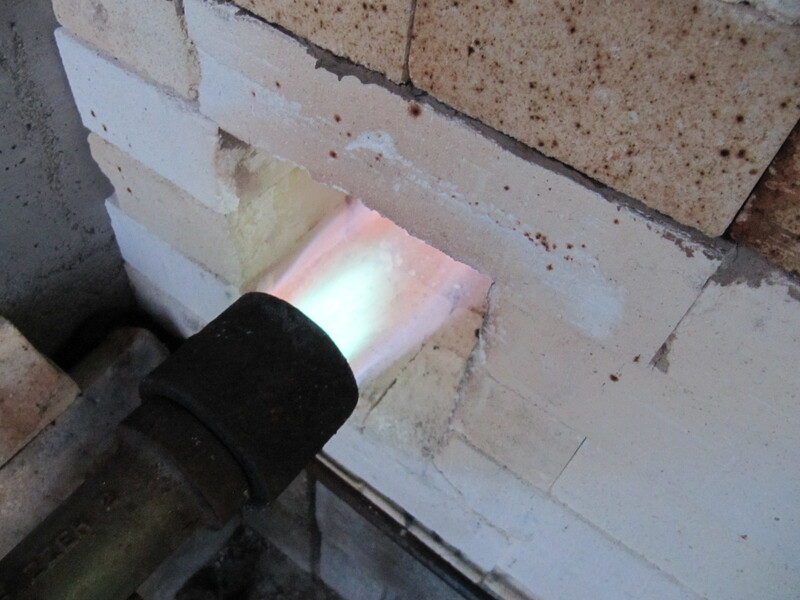 With this kiln, I am most apprehensive at top temperature, when tiny flames lick out of cracks here and there, and I try to estimate the temperature of the 2 x 6′s just a few feet about the arch. An insulating brick layer and generous kaowool blankets swaddle the arch, providing nearly 15 inches of insulation between the hardbrick hot face and the top of the kiln. My next kiln shed will be framed with metal; one less thing to worry about. This load is half stoneware, decorated and painted in my usual manner, and half pure white porcelain. It’s my little experiment; pots for the Making White show at Valley Art this coming weekend. I’ve been blogging about these pots, and have really enjoyed making them in spite of the usual problems with porcelain – mostly, a narrow time window to do attachments. The clay - Georgie’s Crystal Springs – is obedient, and is a very pleasant throwing clay. It reclaims well. I’ve lost quite a few handbuilt pieces, though. It doesn’t like to stay bent and must be dried very slowly. 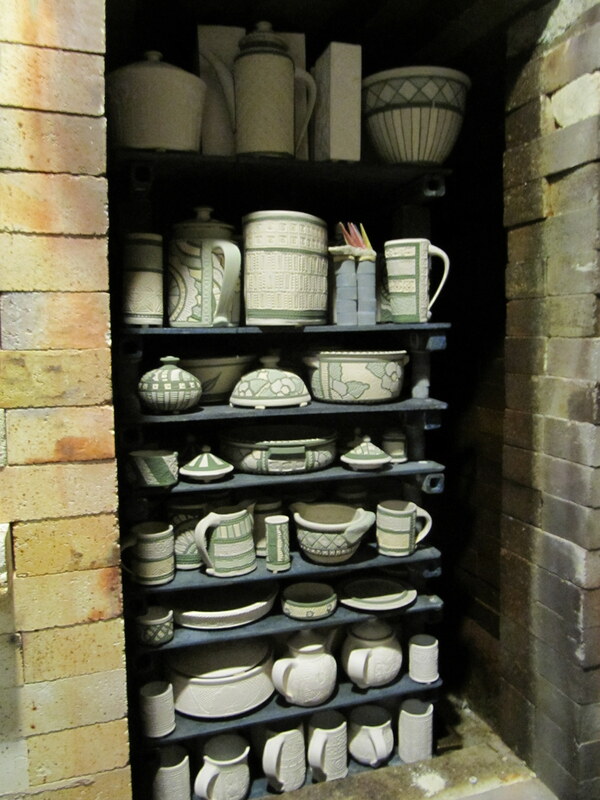 Nonetheless, half the kiln is white porcelain work. There isn’t even a flashing slip on it, and it’s glazed within with beautiful flambe blue glaze that yields a glossy, functional lining for cups and casseroles. A couple of years ago, I fired about six porcelain pieces made in this manner in my salt kiln. Everyone who comes to the studio admires them, so I thought I might someday make enough to sell. I don’t feel that I can take the porcelain pots to my juried shows, because they will be so different from my jury images. Some may make it to Showcase, where we OPA members get to show whatever we like. I kept the white pots together in the kiln, as much as I could, because I am concerned about all the cobalt that circulates in my kiln during a firing. Some of the first few porcelain pots show signs of copper flashing, which is rather pretty. The main source of copper was actually from the flambe blue liner itself, which contains a lot of copper carbonate. I am really eager to see how much pigment moves onto these pots, even though it may spoil them. Ah, science…. It’s got to be wild in there; 400,000 BTU’s per hour rearranging the molecules of mud. Here’s the stack – you can see the white pots at the top and bottom. Tomorrow about 11:00 AM, I will take out the thermocouples, and with a mallet knock the channel iron bars that hold the door shut out of their rests. I’ll pull the door, which hangs from a heavy iron I-beam, carefully out of the kiln about 5 inches so a space is made at the top for heat to escape, The kiln temperature will still be over 500 F when I start to move the door. It’s very hard not to pull it out far enough to have a peek into the chamber, but I’ll be resolute. At 5 PM, I will draw the work and see what useful, and hopefully beautiful, pots have come into the world.